The Ramky Foundation was formed on August 12, 2006 under the leadership of Smt. A. Dakshayani, its Managing Trustee. The five zonal and three regional offices give Ramky Infra the ability to execute projects in any region of India and in the UAE & West Africa. 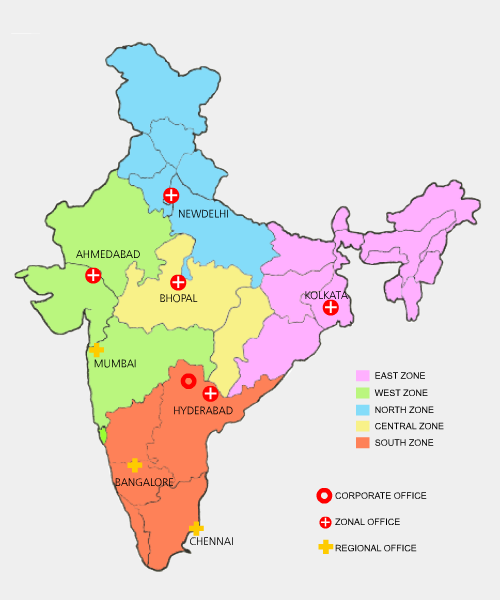 Ramky Infra has zonal offices in Hyderabad, Bhopal, Ahmedabad, New Delhi and Kolkata and regional offices in Chennai, Mumbai and Bangalore to ensure a national presence. All the offices are backed by efficient technical and administrative support, formalized management, project management resources and all the facilities necessary for effective functioning, The synergy of all this support goes into making Ramky Infra responsive and well positioned to meet customer requirements in real time. Copyright © 2017 Ramky Group. All rights reserved.